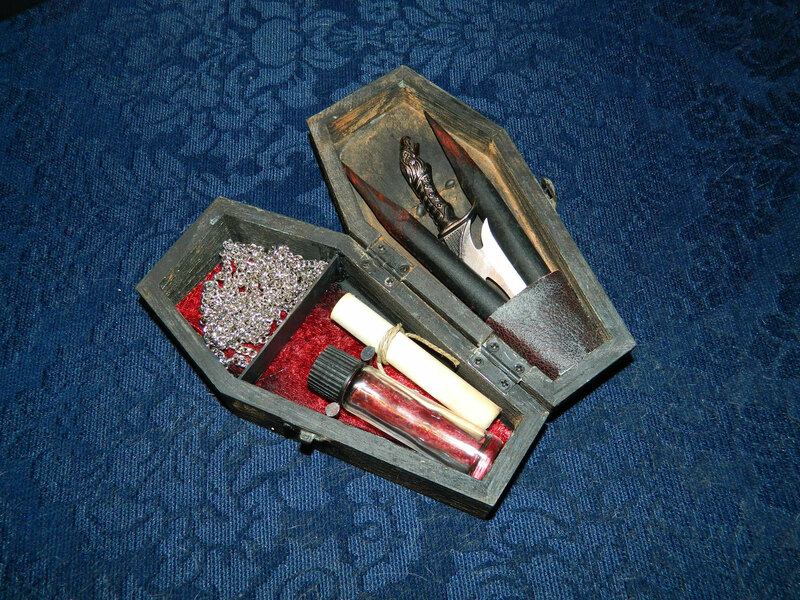 Just in time for Halloween – several new items in the Vampire Killing Kit Shop on Etsy! CRYSTOBAL has created a few inexpensive, fun items for this Halloween season. There will be a few more to come, but as always, every CRYSTOBAL piece is unique. This small (7″) kit has been created inside a wooden box that is made to look like an antique coffin. The kit contains two stakes, a fantasy dagger, vial of Holy Water, silver chain, cross stake and Exorcism prayer, all in this mini size. Regularly a kit like this would go for $49.95. This kit is being offered at only $29.95! Similar in size to the mini vamp kit, this coffin-shaped wooden jewelry box is perfect to hold your rings, earrings, or necklace. Padded with rich, red velvet. only $12.95! No vampire slayer should be without this! One of CRYSTOBAL’s infamous trademark cross stakes, bound with a leather X, mounted on a fired-wood wall plaque. 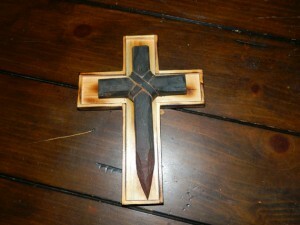 Cross comes off easily for fast response to a vampire attack in your home. Two available. Only $15.95! As of 9/18 the two cross-stake wall hangings have been sold. We may be creating more before Halloween. The mini coffin kit is still available.